That part of Edgbaston north of the Hagley Road was developing rapidly as a high-status district in the second half of the 19th century. With the parish church of St Bartholomew being some distance away and short of accommodation, a church was needed. St Augustine's church was designed by the renowned Birmingham architect J A Chatwin in stone in the late 13th-century style and consists of an apsidal chancel, nave, aisles, and north transept. The land for the building was given by Joseph Gillott, the famous pen manufacturer and a local resident with the church set on an island site with clear views from the approaching roads. 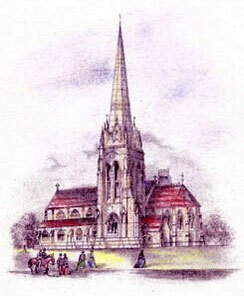 The church was consecrated in 1868 as a chapel of ease of St Bartholomew's, Edgbaston. A tall south tower with a spire was added in 1876 also by Chatwin. However, on Christmas Day 1896 part of the moulding on the spire fell to the ground with more falling onto the roof of the clergy vestry six weeks later. Another Birmingham architect, F B Osborn was employed to put matters right. A parish was assigned out of St Bartholomew's in 1889. 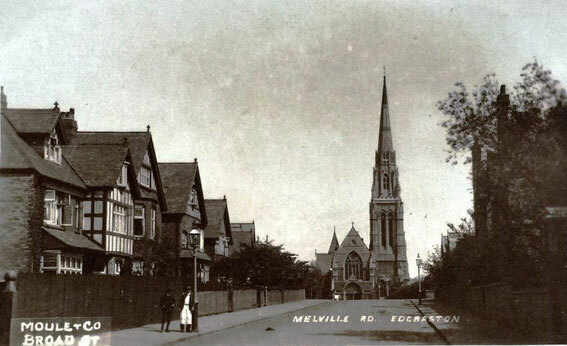 Part of the parish was transferred to St John's, Harborne in 1906 and part was taken to form the parish of St Germain, Edgbaston in 1920. 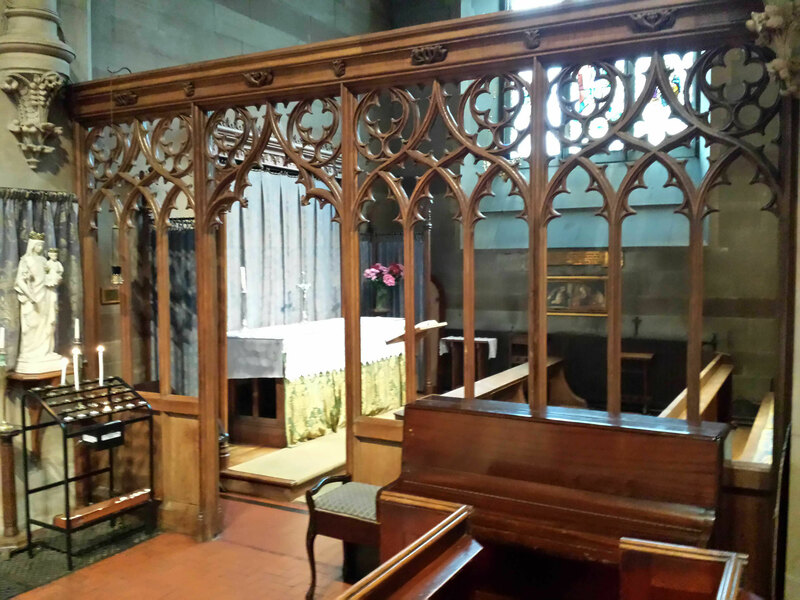 The Lady Chapel was created in the south aisle and transept about 1930, and divided from the nave by a pierced timber screen carved by the noted Bromsgrove sculptor Robert Panchieri. During the Second World War in 1940, the St Augustine window was destroyed by a German bomb; it was replaced in 1954 but apparently mistakenly depicts St Augustine of Canterbury rather than St Augustine of Hippo. In 1964 a baptistery was created in the north transept, designed by the George Pace who also designed the new font. 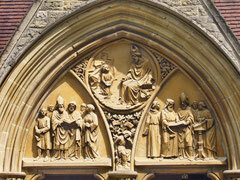 To celebrate the church's centenary in 1968, a new narthex porch was added at the west end to an earlier design by P B Chatwin. 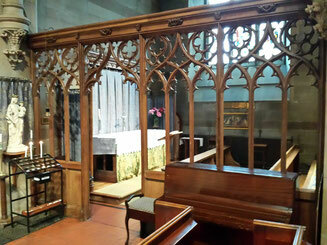 The church is richly furnished and a good example of a late-Victorian church architecture inside and out. The church website - http://www.staugustines-edgbaston.org.uk/. 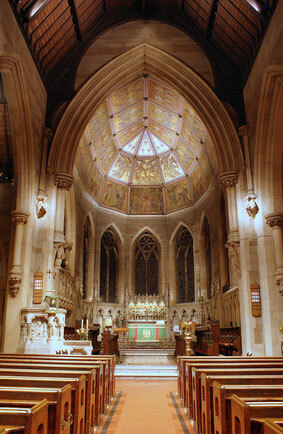 From this site, a Jubilee booklet (1868-1918) is available, setting out the history of St Augustine's and also the foundation of St Germain's, Edgbaston which was built by the congregation of St Augustine's - http://www.staugustines-edgbaston.org.uk/docs/jubilee1918.pdf. See also Aidan McRae Thompson's photographs on Flickr of the stained glass at the church - https://www.flickr.com/photos/amthomson/albums/72157651371363578.